Looking for a rural retreat just minutes from urban amenities? Nestled in the heart of the quiet Falcon Heights community is a gorgeous, fully updated rancher on FIVE acres. Modern cabinetry, new carpet, fresh paint, and countertop resurfacing make this 3 bedroom, 2 bath home feel NEW. Thoughtfully laid out, open concept with over 1700 square feet of room to spread out. On the outside you can enjoy a private view of Pikes Peak and the Front Range from the rear concrete patio, extending the full length of the home. The 69x12 patio is the perfect space to entertain, bringing the indoors out for those warm summer months. 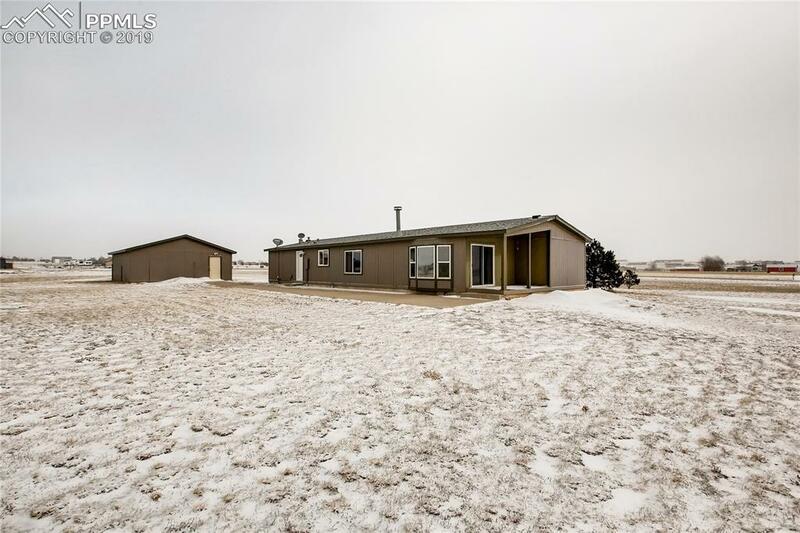 If you're needing more space than the three car garage, the almost double acreage compared to most Falcon Heights properties provides an endless opportunity for your personal vision; shops, barns, horses, chickens, and/or even a she shed. Please note: Water and trash are included in the the HOA fee! Listing provided courtesy of Exit Realty Dtc Cherry Ck Pike.